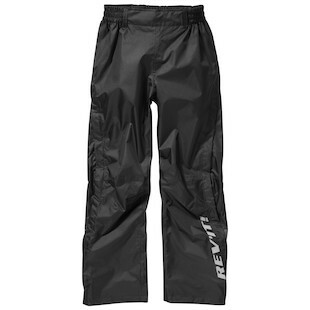 The REVIT Hercules Pants and REVIT Sphinx H2O Rain Overpants let commuters and touring riders suit up quickly, thanks to the two-way easy entrance zipper. I wish all my pants had this feature - slacks, jeans, and sweats. I would no longer be just like you with that whole one-leg-at-a-time dealio. The REV'IT Hercules Pants are water resistant with a 600D polyester construction and include height adjustable knee armor pockets, KNOX CE-certified armor is sold separately. The Hercules Pants are a great option for the motorcyclist who wants to get on the road post-haste. These types of commuters have important documents to review at work or else the big deal falls through. Touring riders who choose these pants have to catch a ferry to cross the river at Noon and can’t risk being late. Protective motorcycle gear that is not waterproof needs protection from raindrops. The REV'IT Sphinx H20 Rain Overpants keep your motorcycle pants dry. Pair these trousers with the Nitric H2O rain jacket to have a stowable waterproof setup in your saddlebag. The two-way easy entrance zipper makes it easier to slide these on over your boots and pants when it starts to rain. Pants. Society makes you wear them. You wear them at work, on dates, and on the subway. They keep your legs warm and keep people from calling the cops on you. On a motorcycle, they can save your skin quite literally. However, suiting up before a ride can take precious minutes out of your trip. The Rev’It Hercules pants and Rev’It! 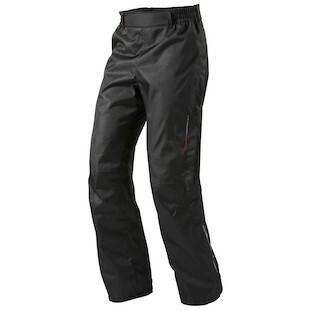 Sphinx H2O Rain Pants are designed to be quickly and easily put on and taken off with the two-way easy entrance zipper. Those precious minutes will let you beat traffic.